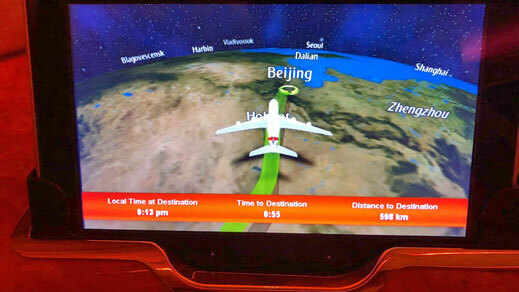 Instead of departing from Dubai to Beijing, I decided to start my journey in Cairo. 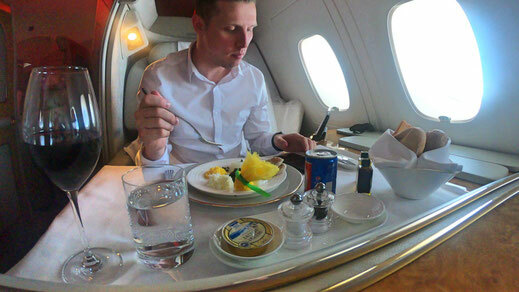 I got to fly both, the Boeing 777 and the A380 in first class for just $1500 one-way. I saved more than $4000 dollars by simply starting my trip in Egypt. This usually works from Tunis as well. 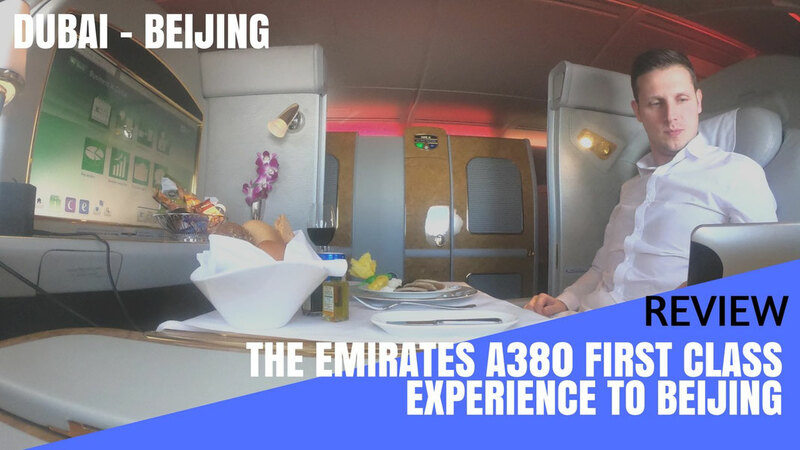 But the big question is, how amazing is Emirates Airbus A380 First Class really? Find out below. 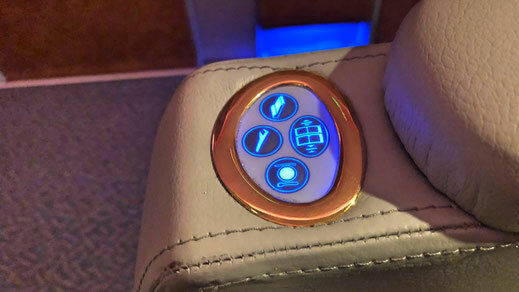 If you don't want to read the review (I know, too many words) you can just lean back and enjoy my video report which gives you a detailed inside of what it's like to travel on Emirates First Class. 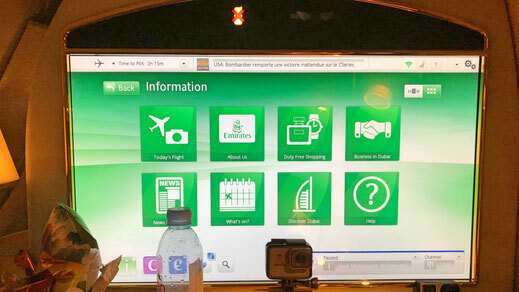 I landed in the morning from Cairo and I had about 4 hours to kill, luckily Sam Chui also happened to be at the First Class lounge because he was reviewing Emirates new First on the 777 to Brussels, check out his video too. 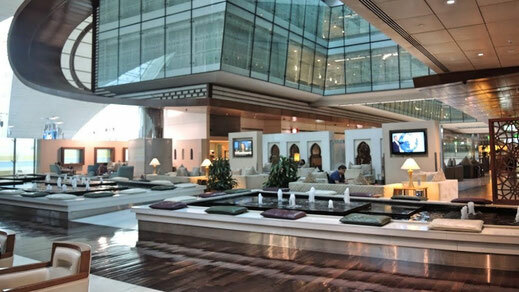 The first class lounge is more of an entire floor exclusively used by first class passengers with restaurants, business centre, cigar lounge, spa and a quiet room where you can have a bit of a snooze. The entire lounge is massive but it doesn't feel very intimate. I still prefer Cathay Pacific's Pier in Hong Kong or Qatar Airways Al Safwa lounge in Doha. Something I like though is that you can board your plane directly from the lounge which saves you heaps of time. I quickly settled myself in seat 3A and I was greeted by the crew. I can't remember the name but he was Polish and extremely funny. He asked whether I wanted something to drink and later came around offering Arabic coffee and dates. He also handed me the menu. The crew on this flight was alright, they wouldn't necessarily go the extra mile I could tell though. The seat is amazing though and features a lot of amazing extras. The coolest thing is probably the automatic minibar, which shuts and opens by simply pressing the button. 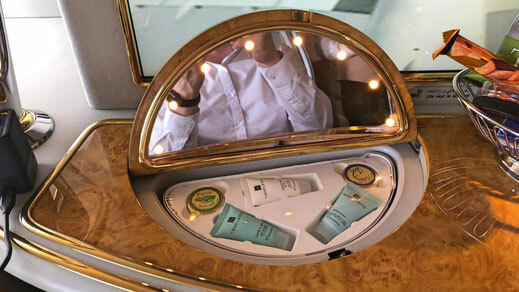 Also the little folding mirror in front of the screen with the little amenities is also pretty unique. The screen in front of you is probably the biggest I have encountered on any airplane. Next to it you have a little basket with sweets and snacks. To operate the screen you can simply use the iPad next to the mini-bar. You can literally watch the news on the little device and a movie on the big TV in front of you. Another highlight is the fact that you can close the doors for full privacy. These doors shut automatically by simply hitting the button at the end of your armrest. Located right under the tray in front of the screen you can find a little writing kit as well. A seat, a bed, a home in the skies! A few hours into my flight I asked the crew to prepare my bed. It was very comfortable but I didn't find it too spacious considering it was a first class seat. In terms of sleeping quality and comfort I way more prefer Qatar Airways Qsuite. Otherwise, I like the fact that you can close your door during your sleep and you feel less disturbed. 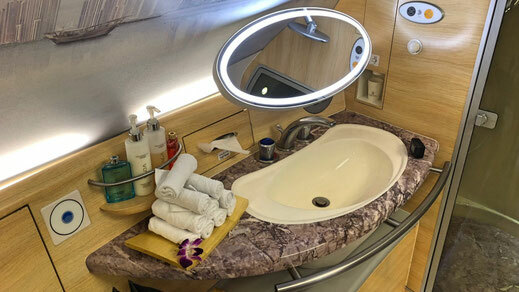 The highlight of Emirates Airbus A380 is the shower spa on board. Before taking off a crew member asked me whether I wanted to have a shower and when. For the next 30 minutes the bathroom is all yours. 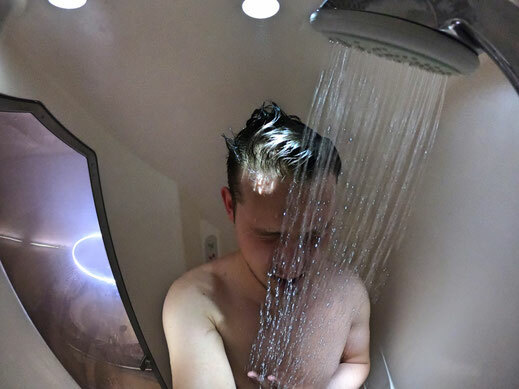 Out of this half-an-hour, you can shower for exactly 5 minutes. 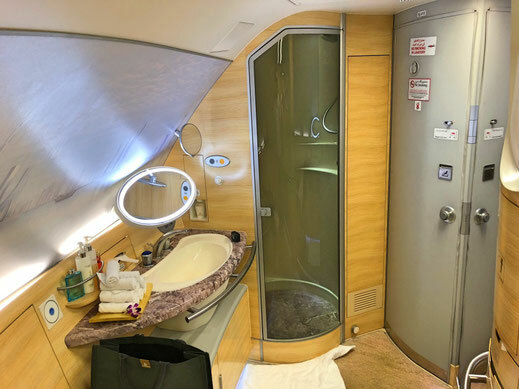 Having a shower on airplane is one-in-a-lifetime experience and if you don't want to join the Mile high club, the coolest thing you can do in the skies. On daytime flights amenity kits and pajamas are only given when asked. So make sure you get your Bulgari Kit before you go for your shower. ...the main course consisted of a steak which wasn't anything special. 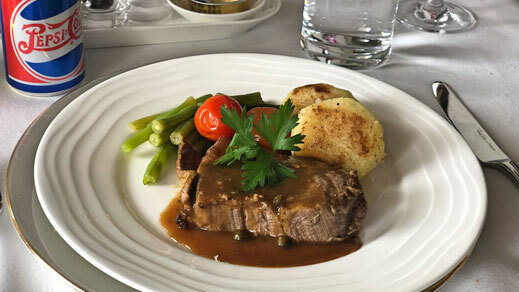 I had better food on Hainan Airlines or Turkish Airlines in Business Class for example. 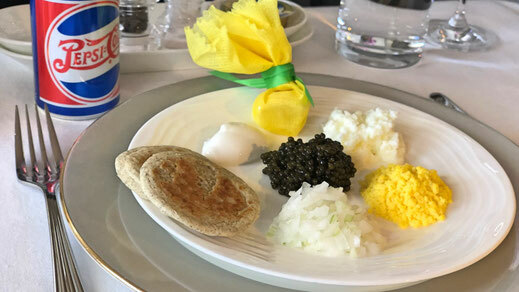 Overall the dinning experience was good but not great or first class. I enjoyed it though. 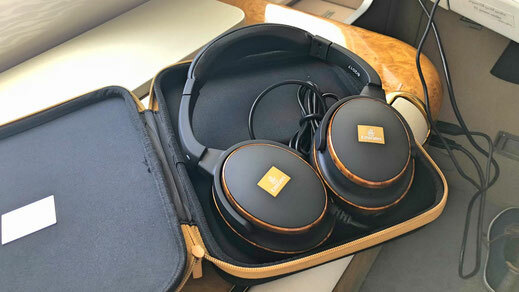 We all know that Emirates offers one of the best entertainment systems onboard their aircrafts and this was no exception. 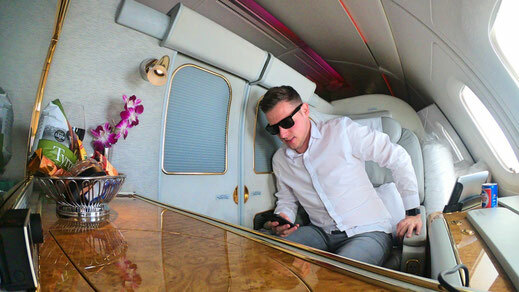 On top of that the Dubai-based carrier also provides each passenger with a 20MB data allowance. It is not much but enough to check your mails, Instagram or Facebook. At your seat you'll find a set of noise-cancelling headphones. They were pretty decent in terms of sound. 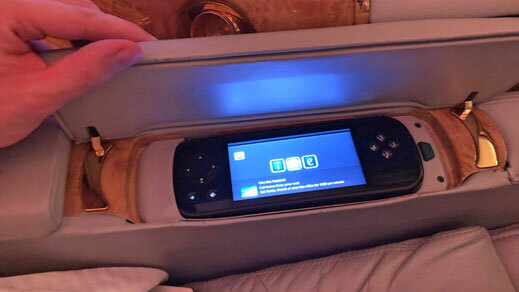 You can either operate the screen with the touchscreen function or you use the remote in your armrest. But you can also use the little iPad next to you, from where you can also operate things such as the light, the doors or the entertainment system. 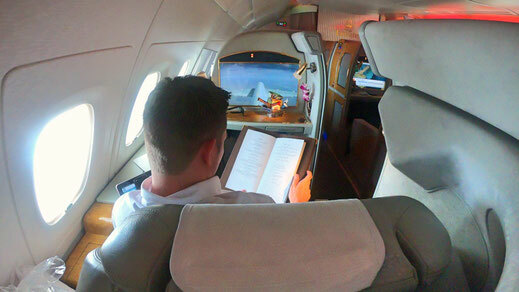 On last cool thing I need to mention is the Emirates sky bar at the rear end of the aircraft. 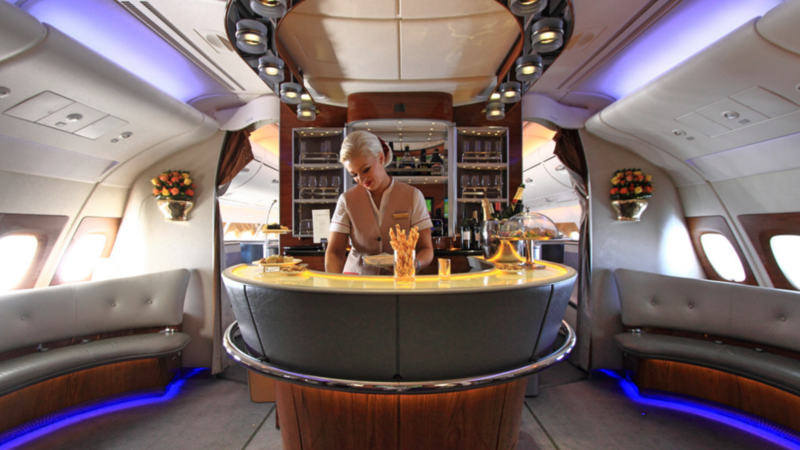 As a Business or First Class passenger you'll have access to the bar. It's a fun place to hang out or to make new friends. 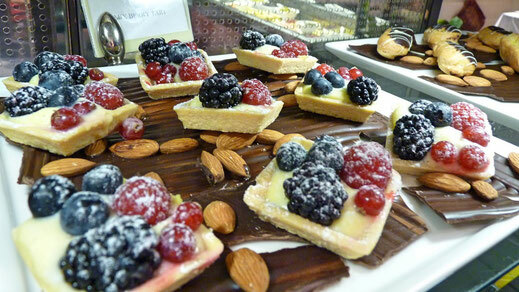 You can get all kind of drinks, prepared by the bar keeper and also little snacks and sandwiches are available. 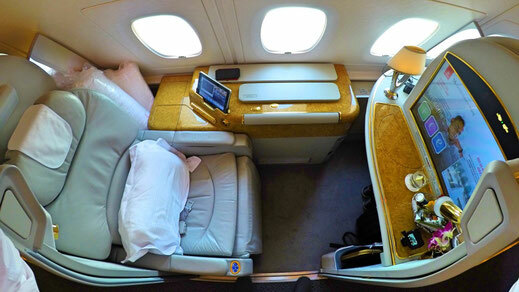 Another cool perk is Emirates limousine service to which you are entitled to as a Business or First Class passenger. You have to book it through Emirates website before your flight though. It's a great service and they pick you up right at the terminal. 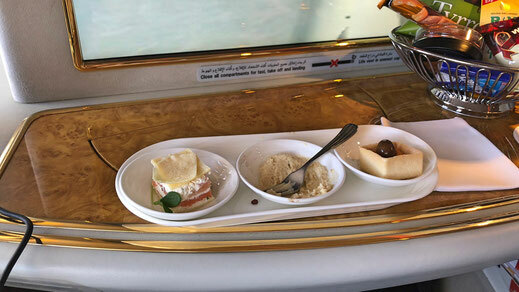 Emirates First Class is an amazing product. 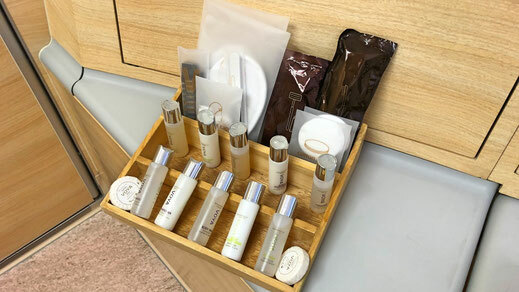 All perks that come with it, such as a complimentary pick up and drop off service, lounge access and priority check-in's are just a few to mention. The true adventure starts onboard though. 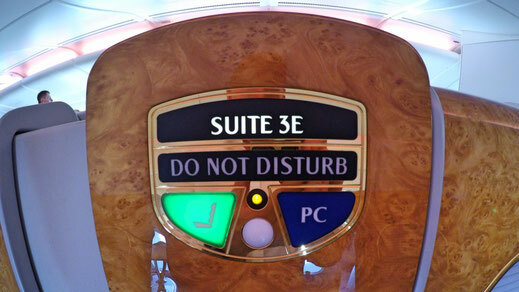 The Emirates spa and shower experience was outstanding and the suite one-of-a-kind. The dining experience probably wasn't that memorable but that would have been the only thing. 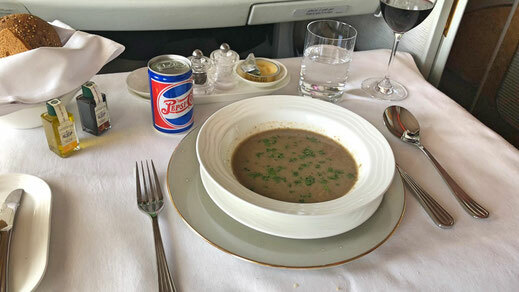 I wish you would get a longer internet allowance as a first class passenger but if you don't surf the internet you can make new friends at the bar in the rear end of the airplane. 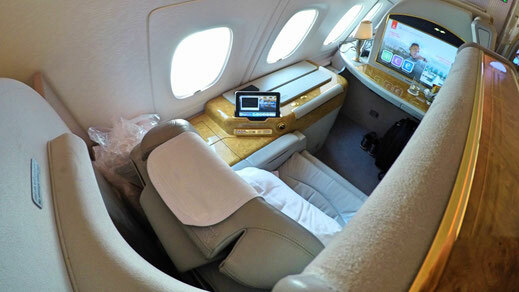 Overall, I think Emirates offers one best First Class products in the industry.